Bundled out of the FFA Cup on the Gold Coast last Wednesday night, South Melbourne Football Club bounced back in style and cruised to a three nil victory over rivals the Oakleigh Cannons in Sunday’s Dockerty Cup Final. But it wasn’t just the highs and lows of cup competition making headlines for the former National Soccer League (NSL) powerhouse this week. With a new broadcast deal set to be negotiated by 2017, expansion of the A-League is again a hot topic and South have received plenty of air time following the Herald Sun’s announcement of the club’s ‘all in’ attempt at elevation to the game’s top flight. – South Melbourne president Leo Athanasakis speaking to the Herald Sun, July 2015. This news of course comes as little surprise to almost anyone that has followed Australian football over the last decade. 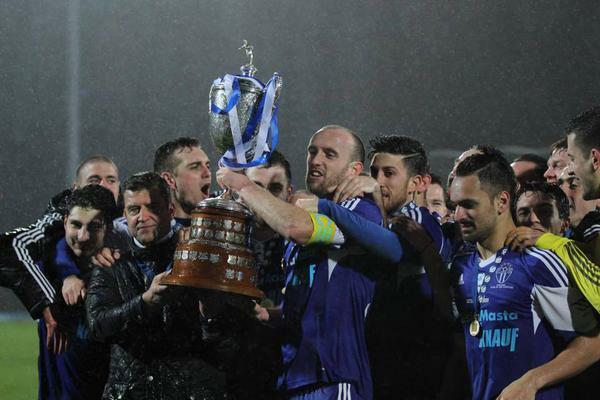 While a magical FFA Cup run didn’t eventuate, the South Melbourne players’ resilience to bounce back four days later to claim the Dockerty Cup parallels the resolve behind Athanasakis’ and the South board’s ambition for the club. 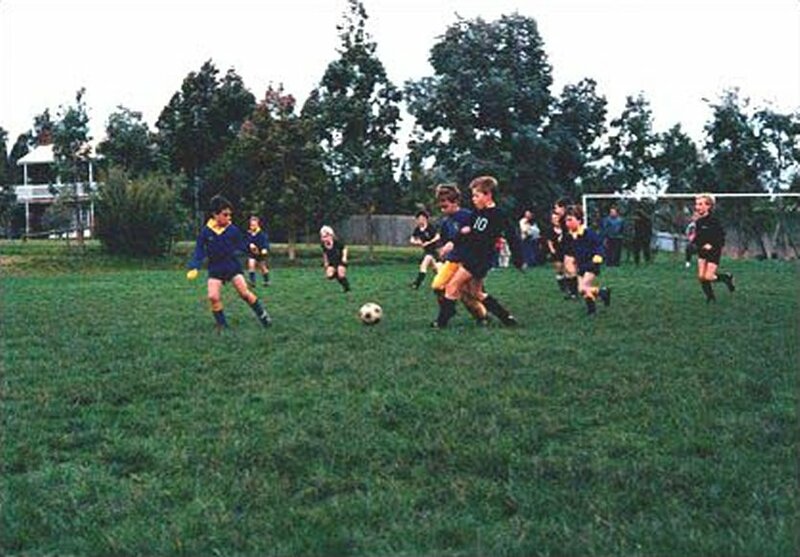 South were one of only two clubs to compete in all twenty eight seasons of the NSL; the demise of the competition and the club’s subsequent banishment to Victoria’s state leagues was a humiliating fall from grace for the four time national champion. Despite making it as far as the 2004 semi-final, South finished the season in voluntary administration; with (the then) Soccer Australia spruiking a one team per city model for its imminent successor to the National League, the decision was taken not to apply for Melbourne’s single license in the new competition. Even if South Melbourne had applied, it is impossible to imagine the game’s new John O’Neill led administration having room for such an icon of ‘old soccer’ in its vision for ‘new football’. Years of political infighting, crippling debts and the stigma of ethnic violence had left the game on its knees. The new moniker was “it’s football, but know as you know it” – and the traditional, ethnic backed clubs were not invited. There can be no arguing that the game hasn’t flourished from the all-encompassing reform that followed. ‘New football’ promised to get the game financial and deliver it to a mainstream audience; it’s success can be measured in levels of sponsorship, attendance and television viewer numbers that the NSL had only ever dreamt about. – former Football Federation Australia (FFA) chief executive John O’Neill speaking to the Sydney Morning Herald, May 2004. But while the A-League has been successful in taking the game to new markets, it has at the same time ostracised many of the old NSL clubs and their fans. Having already suffered the ignominy of losing their places on the national stage, they have also been largely written out of the game’s history. Indeed anyone new to Australian football during the A-League era could be forgiven for thinking the domestic game had no prior history of note – a fact underscored by the FFA’s own website only citing records from 2005/06 onwards. If the perpetual sleeping giant of Australian sport is to ever truly realise its potential – yet alone its self-stated goal of becoming the largest and most popular sport in the country – it will need to not only reconcile its past but embrace it. The introduction of the FFA Cup has been a significant first step. The competition’s popularity has demonstrated that the football public has an appetite for the domestic game that extends beyond the A-League – and that it yearns for tradition and legitimacy. So are South Melbourne Football Club a serious contender for an expanded A-League? The Club has made moves at inclusion before; in 2008, as part of the Southern Cross consortium for the second Melbourne A-League license they were overlooked in favour of start-up franchise Melbourne Heart (now Melbourne City). In 2013 it was revealed that Heart management had rejected an offer in excess of excess of 3.5 million dollars from South to take over the club. Earlier that year South was also linked to the cash strapped Central Coast Mariners but negotiations ceased when businessman Mike Charlesworth took a controlling interest in the Gosford based outfit. Ten years exiled from Australian football’s top tier has given South Melbourne time to strengthen the club’s foundations and improve its fiscal position. 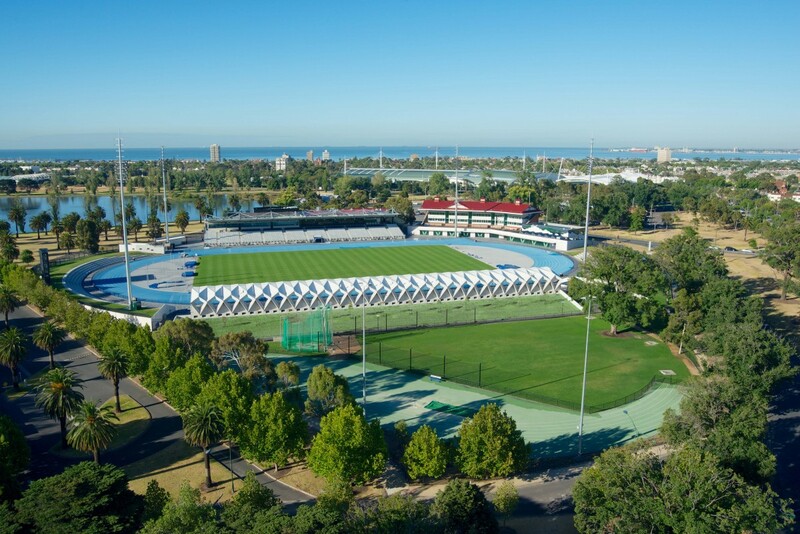 Underpinning the club’s financial security is its much vaunted forty year lease agreement at the redeveloped 15,000 capacity Lakeside Stadium. A social club and futsal centre are due to be completed at the venue in the next eighteen months and would allow the club to generate match day and midweek returns that would be the envy of many of the A-League clubs today. At a time when the majority of A-League clubs are only now beginning to develop their junior structures, South are well established with teams in all grades of the Victorian NPL. The club has a clear pathway for progression through to the First Team, highlighted by a competitive Under 20 side with an average age of just 17 and a number of players pushing for First Team spots. Regular engagement with the clubs media team (South have a weekly TV show on Foxtel’s Aurora channel and a significant on-line presence) also provides its juniors with impressive opportunities to develop off the field with self-confidence and public speaking. Its geographic position, whilst just down the road from Melbourne Victory and Melbourne City, covers a large population and extends to the city’s South Eastern Growth Corridor. Given its already sizeable fan base and with Victory and City arguably the competition’s wealthiest clubs, it is unlikely that South’s inclusion would have an adverse impact on the growth prospects of its neighbours. Indeed it could be argued that increasing football’s presence in the AFL’s heartland only raises the profile of the game and should help all three clubs to compete with the rival code for fans’ dollars. Under the current A-League format, each team plays its opponents three times across the regular season. A third side in Melbourne immediately adds a minimum of six highly profitable derby games to the calendar and means matches featuring Victorian teams could be broadcast in to the competition’s largest market outside of New South Wales on the majority of Fridays, Saturdays and Sundays from October until May. These factors – coupled with the marketing appeal that a club so steeped in history brings to a competition so desperate for authenticity – could make South Melbourne the FFA’s premium bargaining chip when it comes to negotiating the new broadcast deal to fund the game. The Australian sporting landscape has changed immensely over the last decade and the FFA can be congratulated for delivering the fundamental change football needed to survive and grow. The opportunity now exists for football in this country to truly realise its potential by addressing the fractures in the game brought by that change. While Athanasakis rightly insists South Melbourne’s bid for A-League inclusion should be considered solely on the merits of where the club is today, it does seem fitting that Australia’s most successful club should also be the one to unite the sport. If the FFA are genuine about their ‘Whole of Football Plan’ – then South Melbourne have undoubtedly positioned themselves to be the best credentialed candidate for an expanded competition. ‘Old soccer’ had its time; ‘new football’ has served its purpose. Now is the time to embrace the whole of the game. Found this interesting? Please give it a share! These winners are five of my favourite (in no particular order) football pages from the month of July. There is no hard and fast criteria; the pages that make this list each month can be digital or print, independent or from the mainstream media. This is the medicine that nurses me through the burden of dreary eight hour work days and saves me from endless evenings of tv cooking shows – now that is worth a few frothies. 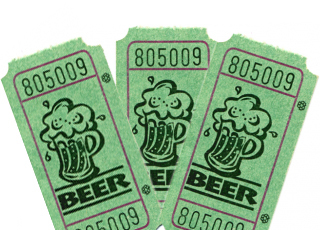 * There are no actual beer tickets. You are all winners. Lets go have a beer. Let me know if you’ve got a suggestion for an anti-depressant to help me get through next month. 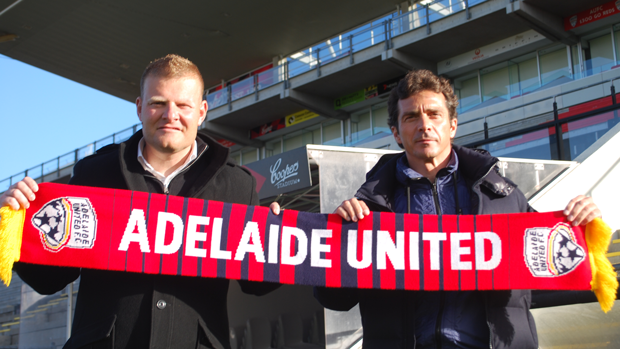 In Guillermo Amor, the Adelaide United Board and fans alike will be expecting the seamless progression of the mission undertaken by departing boss, and fellow Barcelona disciple, Josep Gombau. That mission was to implement a brand of football that would be the blueprint for ongoing success. In his two full seasons at United, Gombau has overseen a revolution in style and philosophy from the First Team down to the Youth Squads, delivered an FFA Cup, two A-League finals appearances and an Asian Champions League play-off berth. The Red’s always attacking, high pressing, possession based passing game has at the same time brought the fans back through the turnstiles at Hindmarsh and won plaudits across the competition. After two seasons of meteoric development, expectations for 2015/16 are understandably higher than they’ve ever been in Adelaide – and new manager or not – the success of this third instalment of United’s Spanish revolution will be judged not by its continued advancement of the style but by its return in silverware. No small amount of pressure for any new manager, yet alone one in his first senior appointment. In his favor, Amor’s pedigree is incontrovertible. Adelaide has at their helm a bona fide legend of the game. One of the first graduates of Barcelona’s famed youth academy, La Masia, and with 421 first team appearances for the club, Amor stands in a select group even amongst his elite peers the Catalan giant. 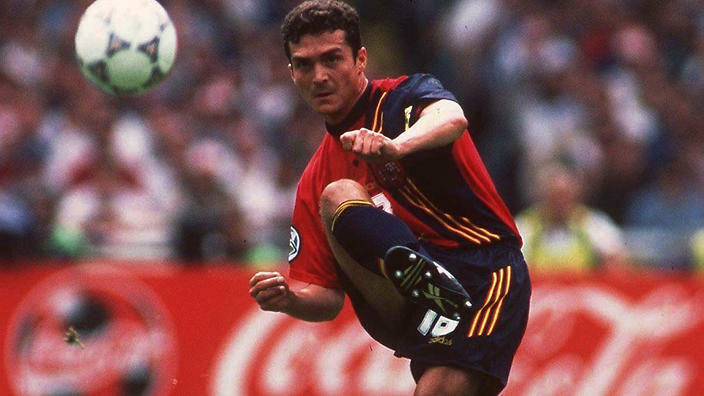 The winner of five La Liga titles (four consecutively) and a member of the trailblazing 1991/92 European Cup winning side, Amor was capped thirty-seven times for Spain and played in both a European Championship and a World Cup. There would scarcely be a club on the planet that wouldn’t clamour to add the forty-seven year olds’ experience and insights to their coaching ranks. Indeed last season Amor was never far from Gombau’s shoulder on the Adelaide bench and clearly behind much of the side’s tactical play. Brought to the club by Gombau twelve months ago in what was initially an advisory capacity, he soon signed on as Technical Director. The two friends and passionate exponents of the Barca philosophy have a working relationship that dates back to 2003 when Amor first worked as Director of La Masia and Gombau was an academy coach. Amor inherits one of most settled squads in the A-League, where transfer activity has been limited but shrewd. After finishing just short of a grand-final spot in May, United have excited with impressive out of season displays against world class opposition in Villarreal, Manchester City and Liverpool. Even with seventy three days still to go before the new season kicks off, most pundits have The Reds’ as serious contenders for the 2015/16 A-League title. So can Amor achieve what to date, no other has, and steer United to a maiden championship? Furthermore, can he do this in just his first season in charge? Football is littered with former champion players who have failed to translate their on-field achievements into success directing from the touchline. Equally some of the game’s most accomplished managers never played the game at the highest levels. Amor has already played a significant role in Adelaide’s transformation. Clearly he has the tactical smarts; he now also has a group of players experienced enough to execute the style. What is untested is his ability to lead the dressing room to perform at their collective and individual best over the course of a season. Achieve this and delivering Adelaide a remarkable first A-League crown at his first attempt is certainly possible, moreover it would pay testament to the philosophy set in place by his good friend and predecessor. And that was the mission in the first place. A black t-shirt with a white hand stitched number 10 over the left breast. Oversized hand me down black shorts. Mud. So much mud. Ankle deep, black and stinking like stagnant pond water. Great for hurling by the handful in the direction of the nearest team mate. A ball pumped so tight it could surely break a frozen toe if contact were ever actually achieved. Pulling faces with mouths full of quartered oranges. Legs stuck in the mud. Now Running! Running! Being chased! Joy. Grinning through caked on mud. In that moment, I’d discovered the most beautiful game in the world. Pitting plumbers and postmen against the game’s fulltime professionals, any club in Australia can enter the FFA Cup and have the chance to progress to face off against teams from the A-League. The Cup Final on November 7 will be the second biggest event on the Australian Football calendar, surpassed only by the A-League Grand Final. Yesterday the Round of 32 was announced and with it begins four months of hyperbole about ‘The magic of The Cup’, ‘Fairy-tale runs’ and most of all ‘The road to the Cup Final’. So what of this fabled road? Where, will we be watching the theatre of the second biggest event on the Australian Football calendar unfold? English football makes its annual pilgrimage to Wembley, Australian Rules to the MCG. The journey and the venue are essential threads in the fabric of the competition, as significant to the narrative of the occasion as the final two remaining sides. And yet our Cup Final venue won’t be decided until just 10 days before the main event. An annual pilgrimage for the game is both a fans and a marketers dream, not least because it allows tickets and travel packages to be sold year round. It provides the backdrop on which the traditions and mystique of the Cup can be written. The FFA Cup is the vehicle to finally unite the wide base of the of the Australian football pyramid with the elite top flight, it deserves to be iconic. Our Cup, and it’s legend, deserve a home.